It’s optional so you can have each on its own separate card. But while the informational material provided touts the convenience it fails to point out the inconvenience also. 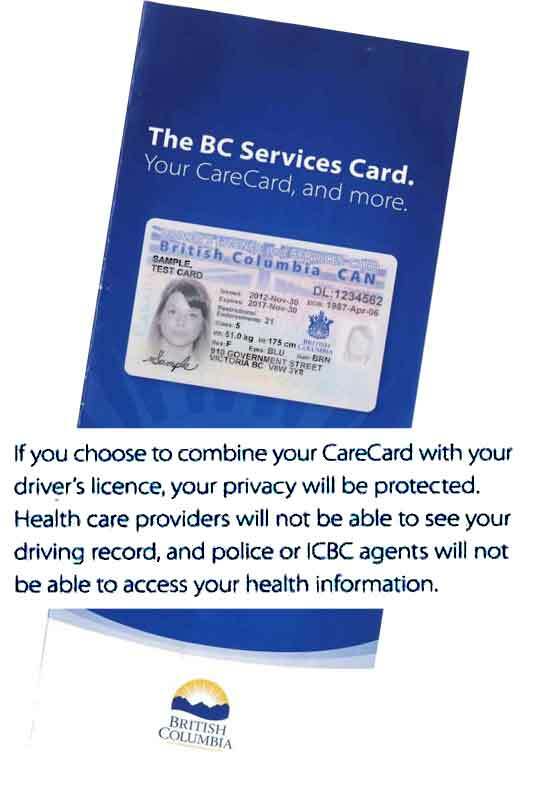 Even though the physical card has his picture on it and represents two distinct government IDs the ICBC representative could not count it as two pieces of ID. How many other instances of having to provide multiple pieces of valid IDs to some government or business functionary will have the same issue? the Medical Virtual You and the Driver Virtual You, your information (or as we in computers call it your Metadata), is considered Two things which are Separate and discrete in the Virtual world of government data systems that the staff at health care providers and ICBC offices and police agents work inside. the Real World physical card that is your combined connection to those Virtual You’s is considered One thing for the purposes of verifying that You, the one and only Physical You, standing before someone else who requires two physical representations of Virtual You’s to provide some Real (or Virtual) service are the Real You and not someone else. So if you have not made the decision yet to combine or not I hope this will help you make a better informed choice that suits your requirements. But if that’s not enough let me point something else out . . . If you should need immediate medical services, especially emergency services, the doctors and hospitals in the province will provide you that service. Without you giving them your MSP or BCSC card. (you could write the number down and put it in your wallet) Hospitals and Doctors actually have a 90 day window of time in which to submit for billing to MSP required by provincial Medical Services – that means you have a window of time too. Why would you leave your MSP or BCSC card at home? Let’s say that along with all your other cards and IDs you have it and your driver’s licence together in your purse, or wallet, And it’s stolen or lost. Now you have to recover your physical IDs by contacting agents of government and business to get replacement IDs. Because you now have no valid government ID the government agency will require you to provide a birth certificate at a minimum. Don’t have a birth certificate? If you were born in BC that’s just a small fee and a wait – if you were born elsewhere it can be a bit more complicated because you’re now dealing with government agencies from a distance. In some provinces you can deal with this over the phone or the internet. And pay a small charge. In Ontario you have to have someone be able to show up before an official of the government (there in Ontario, not here in BC) and vouch for you so you can get a Birth Certificate. If you are an immigrant the complications could require more money, time and red tape to resolve. And get quite expensive. If you’d just left your BC Services Card card at home it wouldn’t have disappeared with your wallet / purse and your journey back to having physical ID connecting you to your official Virtual You’s would be so much shorter and less expensive. Over the past decade laws regarding personal privacy and rules regarding security have tightened up quite a lot. Which makes sense in most urban centers where hardly anyone knows anyone else. But we in Grand Forks do not live in that kind of place. In a small town like Grand Forks it’s quite likely that people on one side of a service counter will know the person on the other side. They may not know the ID#’s that tie that person to their virtual metadata but they know the actual real person. The person I referred to earlier, the one renewing his driver’s licence, was known to most of the people in the insurance office that serves as our local ICBC office. He’s a past city councilor, member of the arts community who appears on stage, singer / performer and businessman. But, even though he’s all that, the clerks serving him have to slavishly follow regulations because those are the rules. That’s backed up by laws which could create real trouble for them if they do not follow them. I understand some might disagree with the implications of slavishly but when you have no choice in the matter on pain of job loss and worse what would you call it? They are not alone in that. Other positions where the public is served by any entity directly influenced by these rules have to behave the same way. The person on the other side of the counter may be your next door neighbour, your best friend, a blood relative – if you skimp on the details in doing your job and get caught the consequences can be harsh. There was a time when your reputation and a hand shake were good enough for many of these interactions but I guess that’s just ancient history now. These types of ‘one size fits all’ applications of stringent rules removes any sense of humanity from the transaction and reduces you to a few pieces of plastic that stand in as a virtual representation. Technically: You aren’t You – the plastic stand-ins for Virtual You are You. Maybe that’s part of the system that those who drop out and ‘go off the grid’ want to turn their backs on. So they can feel Human again. 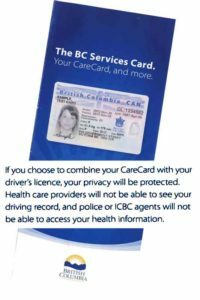 UPDATE: BC Services Card was incorrectly called BC Client Services card – mentions have been corrected. This entry was posted in government and tagged ICBC, ID, licence, services on November 2, 2016 by gftvboss.